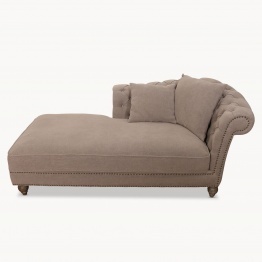 A Chaise Longue is an elegant sofa designed in the shape of a chair which is long enough to support the legs. In modern French, Chaise Longue refers to a kind of chair that is reclining such as deckchair. 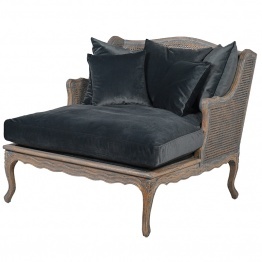 An important part of Chaise Longue Chair is that it is intended for extended relaxing – even napping. If you’re looking for a way to sneak in stylish sophistication to the decoration of your home, French Chaise Lounge is the best option. If you want to outfit a reading nook or like to add extra seating to your bedroom area, Chaise Lounge Chair is sure to be a chic accessory that will complete any look. It will serve you like the best investment piece, so be sure to make the right decision when purchasing by understanding what to look for and deciding what chaise lounge is right for your home. It depends on the style of your bedroom that what kind of French Chaise Longue you should get to enhance the interior of your bedroom. By considering the theme and style of your bedroom, go with the kind of Chaise Lounge Chair that can add an elegant touch to your bedroom and look trendy as well. Whether you have a traditional or trendy bedroom, La Maison Chic with its advanced, classic and beautiful options of Chaise Lounge Chair provides you a comfortable and cozy furniture piece. When it comes down to function and aesthetics, nothing can beat the variety available at La Maison Chic. It provides you with a piece that is entirely designed for relaxation with a durable material and eye-catching colors. It holds a broad range of stunning yet affordable classical French linen upholstered and stylish velvet Contemporary Chaise Longue Chair that mostly complements your beautiful bedroom. When you treat your entire bedroom as one ensemble, you will end up creating a beautiful space for sitting and relaxing purpose. Sometimes, the sophisticated Chaise Longue Chairs available at La Maison Chic become the signature of your bedroom’s decoration and your bedroom gets famous with the name Chaise Lounge Bedroom because of the quality, flexibility, and texture of these chairs. The color and style of Chaise Lounge never go out of style because of its unique craftsmanship and texture. La Maison Chic is famous all over the world with the extraordinary history, heritage, craftsmanship, durability, and reliability of the products it offers. Chaise Lounge always adds a touch of modernity and functionality in your bedroom so you can trust them blindly while looking for a piece that will fit exactly to the needs of your bedroom. A vast collection is available in French Chaise Lounge at La Maison Chic that gives you much more choices as well as flexibility to buy for your bedroom what you need exactly.